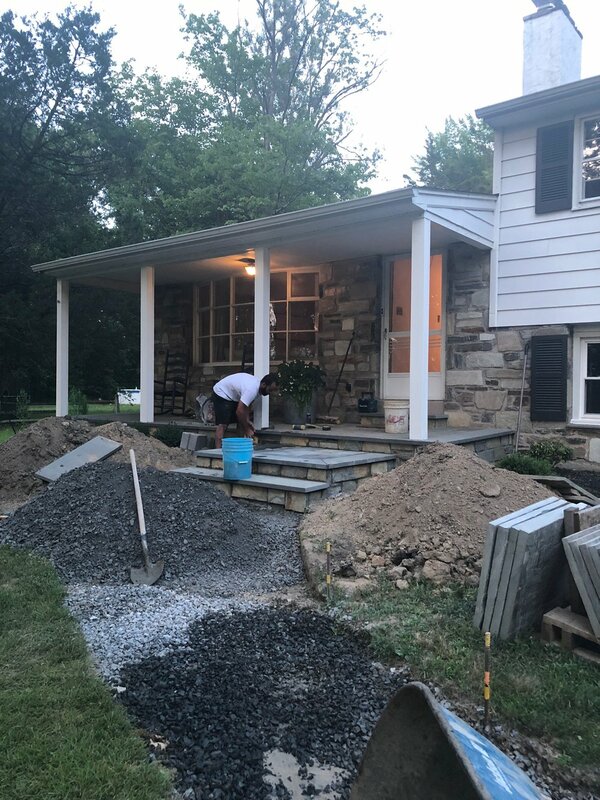 When we moved into our house, Mike had big plans for our front porch and walkway! 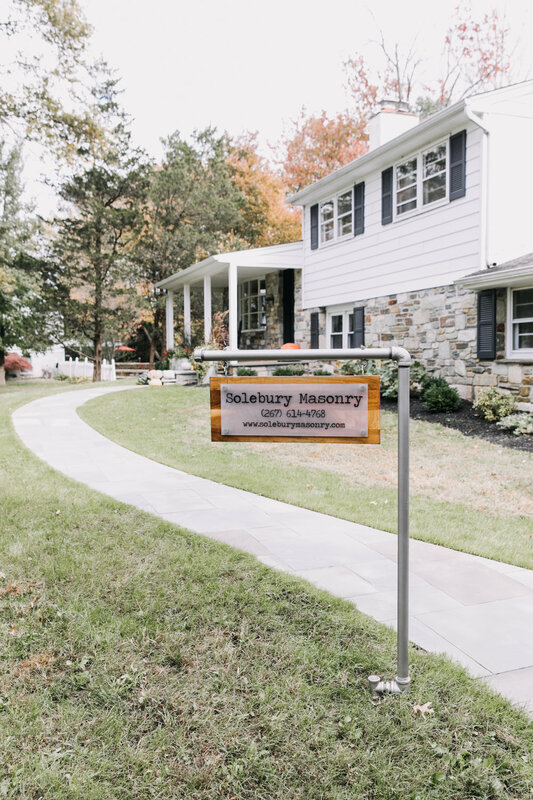 Because he only worked on our house on the weekends (okay, and one week I made him take off to wrap up), we did this project in stages. All in all, we were working on different parts of this renovation for a year and a half. That made it even more fun and satisfying to go back and collect all of these photos to share! 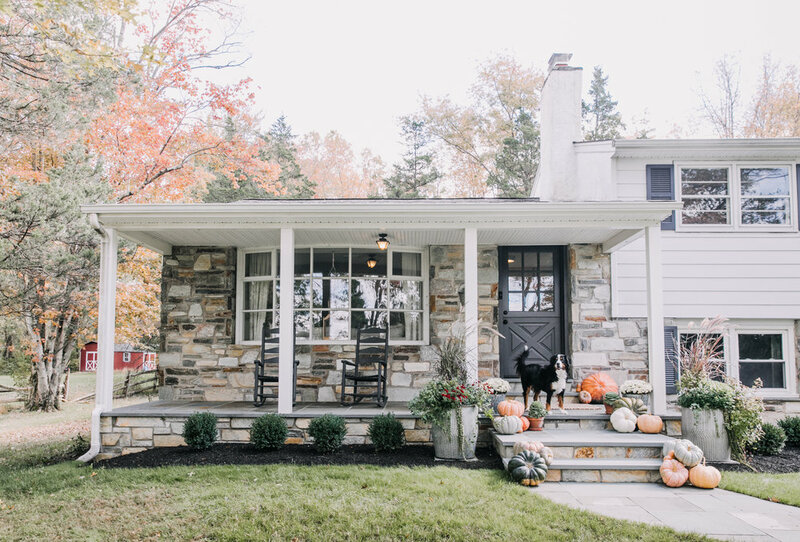 I think this really shows that some minor cosmetic changes and new hardscaping can totally transform the curb appeal of a home. Here’s the before! 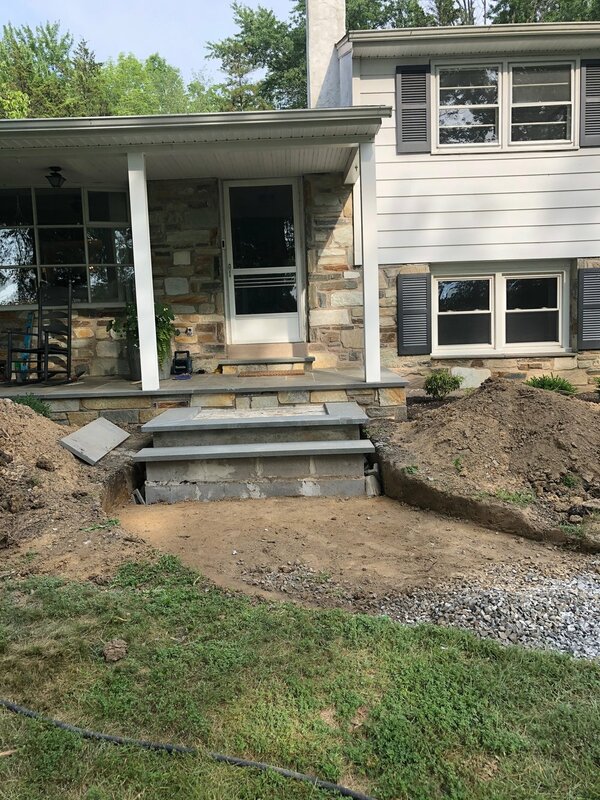 Phase 1 of the project was covering up the concrete porch. 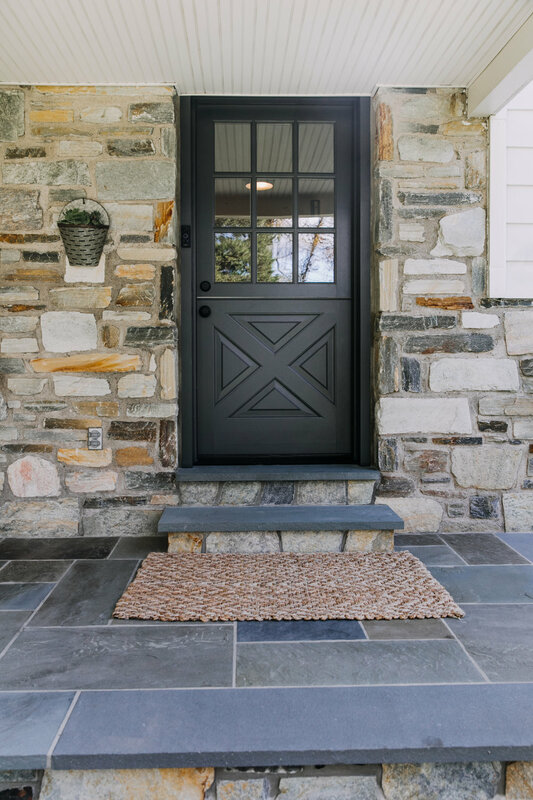 We would add stone to the front of the porch to match the house and bluestone to the top surface. A blank slate just waiting for Mike to move in and work his magic! 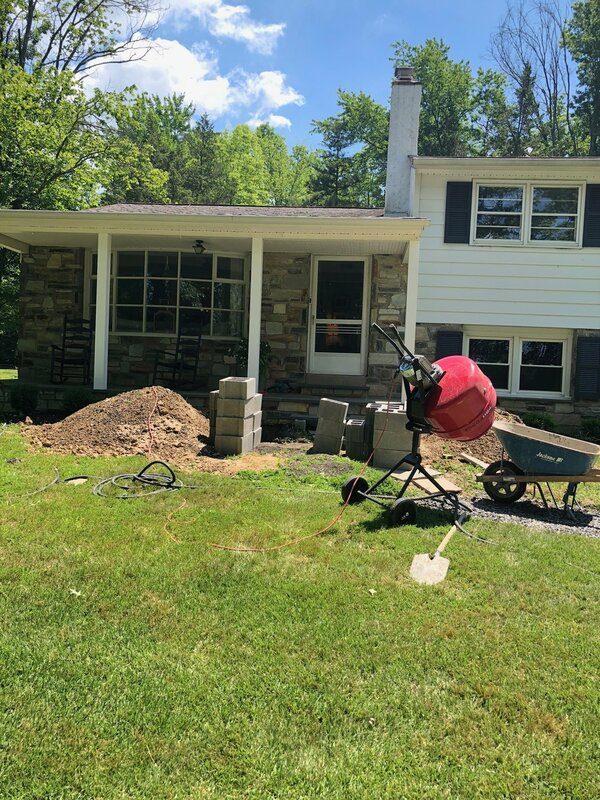 We also planned to replace the existing pillars (you can see that we already took a few down when we remembered to take the before picture). 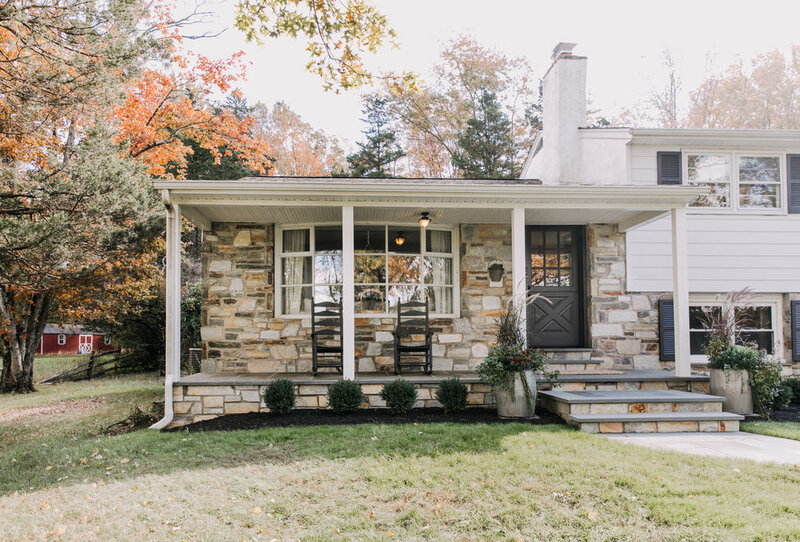 We were able to match the stone on the house with thin stone from Delaware Quarries. 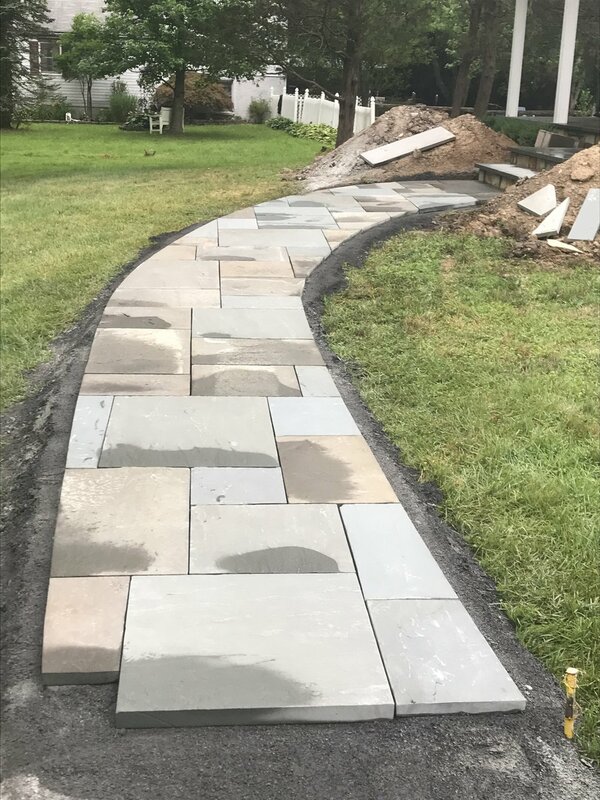 After the stone was added to the sides, we added a bluestone tread border with random pattern bluestone in the center. You can see the thicker pillars that we added here. I wasn’t convinced that we needed to make this change, but I am really happy Mike insisted. It is one of those things that you wouldn’t specifically notice, but makes a big difference overall. We also pulled the old landscaping out so we could start over with a new bed layout and plantings. 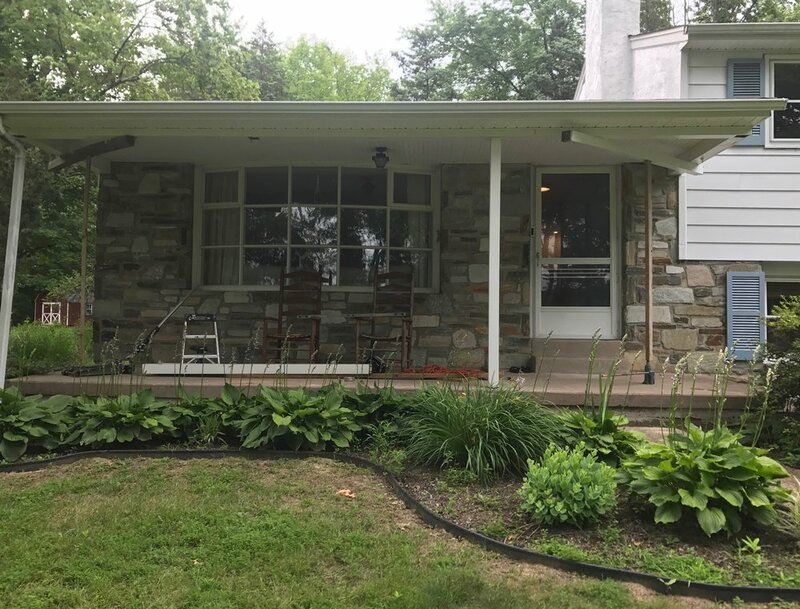 Here you can see how the stone that was added to the porch matches the house. You can also see my least favorite feature that we rocked for a year after this picture; a cinder block step! This portion of the project was wrapped up in August 2017. In October 2017, we were back at it! We decided to paint the shutters a darker color; Benjamin Moore Wrought Iron. Christening the bluestone porch with the first of many pumpkins! Mike also kicked off the planning for the landing and the walkway. 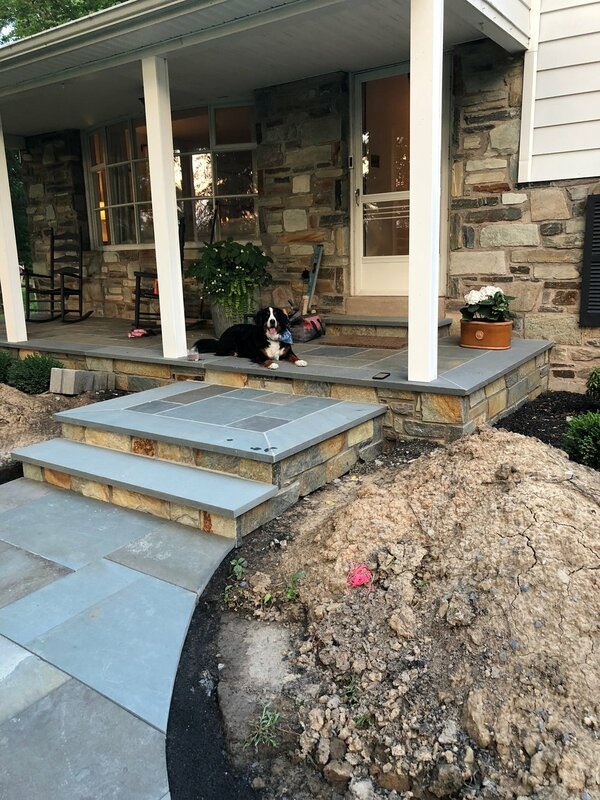 We planned to add a large landing out front and replace our concrete walkway with bluestone to match the porch. Demolition time! 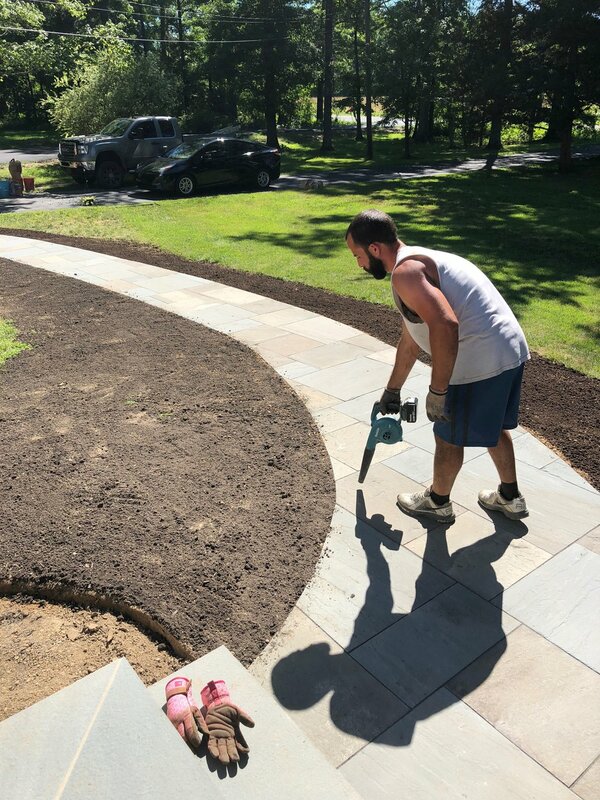 Mike jackhammered the existing concrete walkway. After it was demolished with the jackhammer, we removed the concrete. 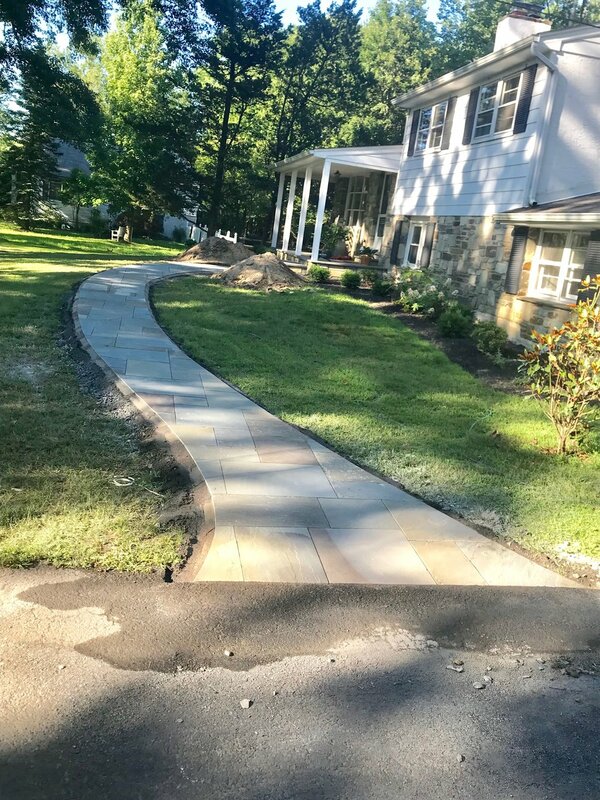 We took this opportunity to widen and reshape the walkway. 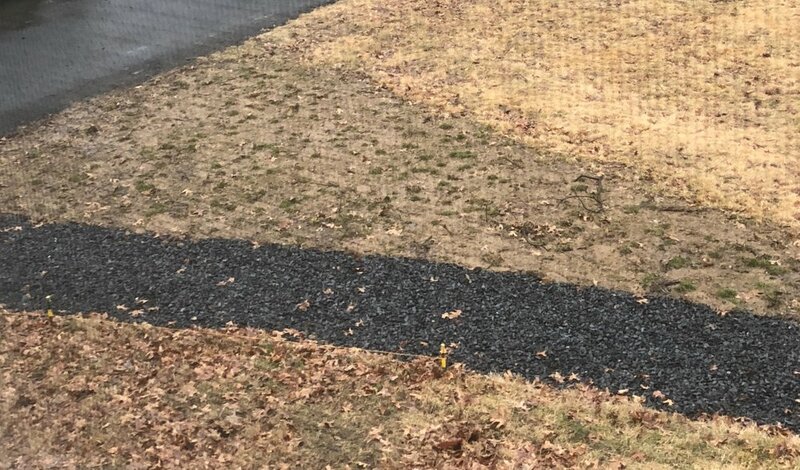 The empty walkway area was filled in with gravel. 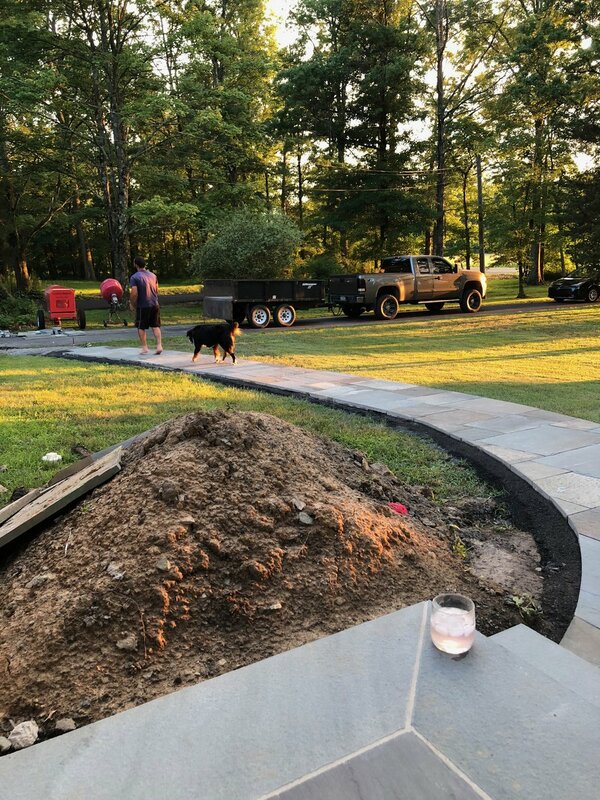 Adding crushed stone was the first step in the construction of the walkway before adding bluestone; it would also be our walkway until Mike had a chance to pick back up on the work at our house. Fast forward to July 2018! 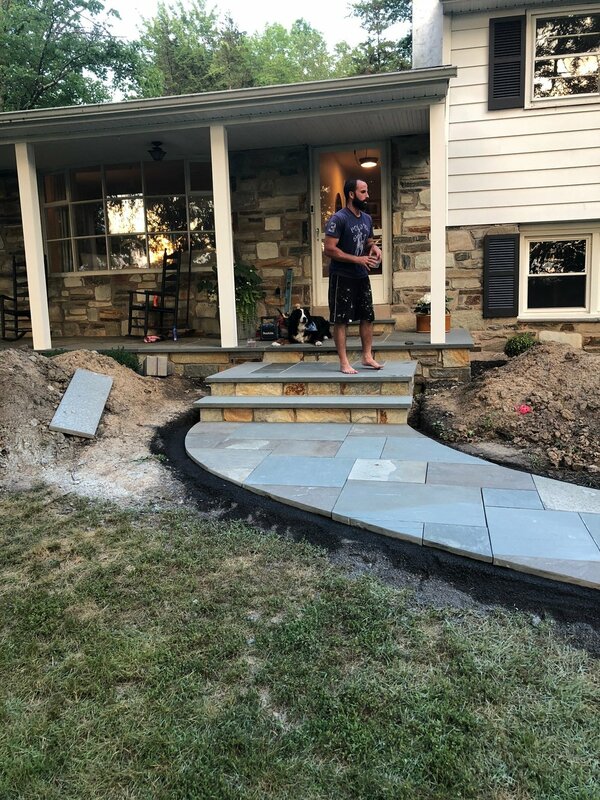 Mike took a week off to work solely on the landing and the walkway. First, he dug and poured the footers for the landing. You can see the makeshift little walkway that we had going on in the background of this picture. That was my handiwork! I couldn’t believe how deep the hole had to be to build the landing! This was all going on over the July 4th holiday, so I was actually home for a lot of this process. It was crazy to see Mike in action and how much work went into all of this. 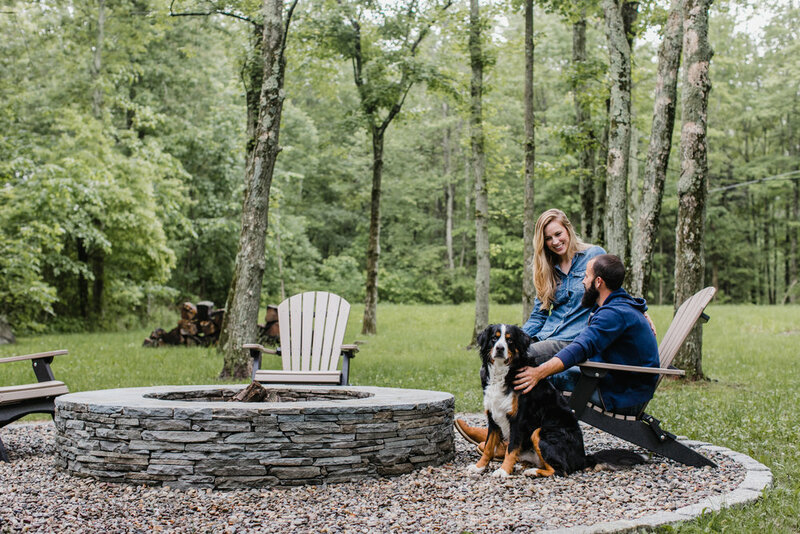 Every night, we would sit outside with Maggie and talk about the progress. You can really start to see it coming together here! 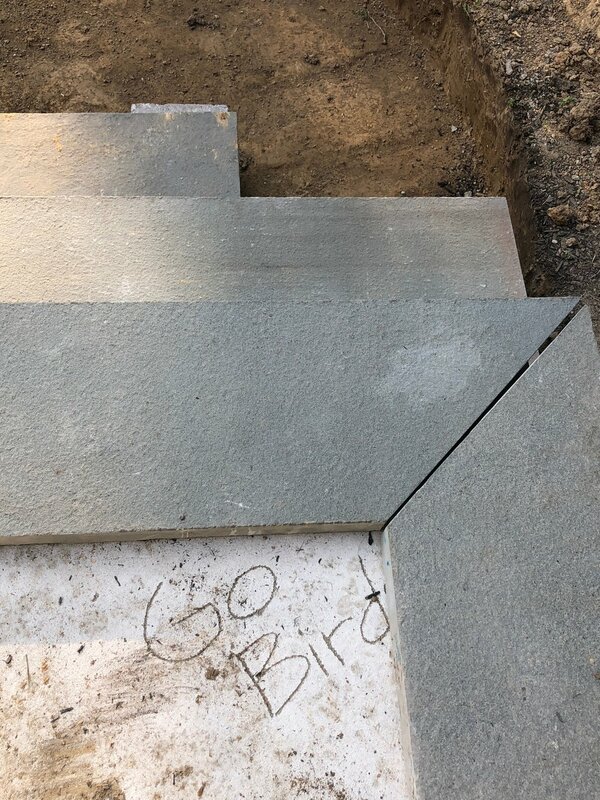 Go Birds!! We had to add a tribute to the best memory of 2018! 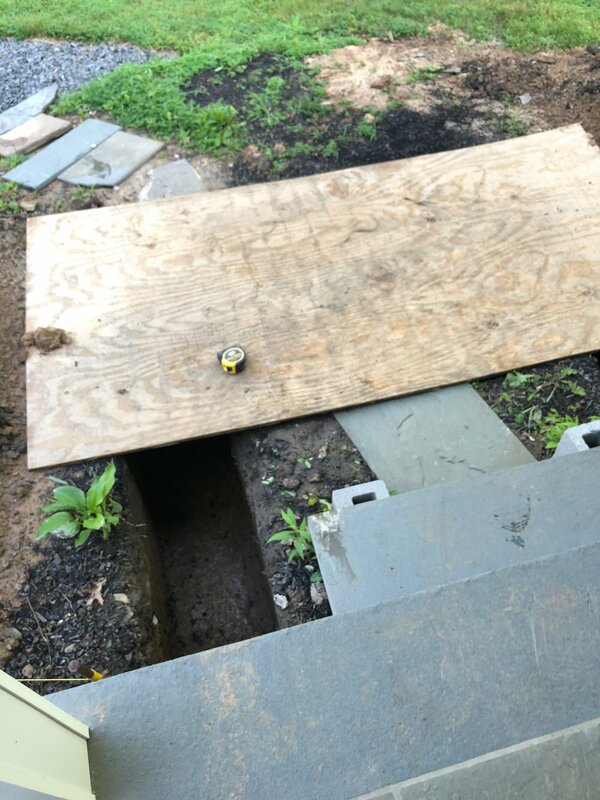 Cool to think this is under the step that we use every day. Landing complete! 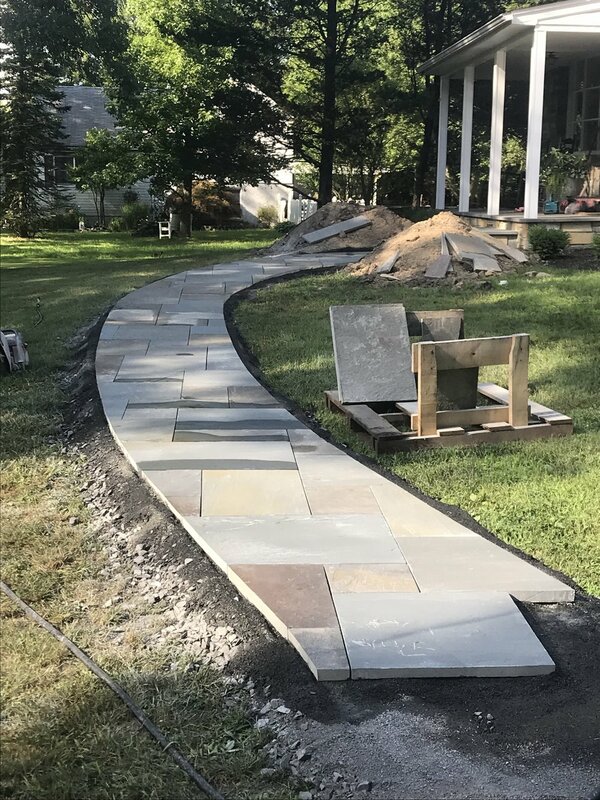 Now it was time to finish prepping the walkway and then lay the bluestone. Mission complete! This night, we had to have celebratory cocktails. Mike started to teach Maggie how to use the walkway. After the walkway was complete, the final step was grading the lawn. 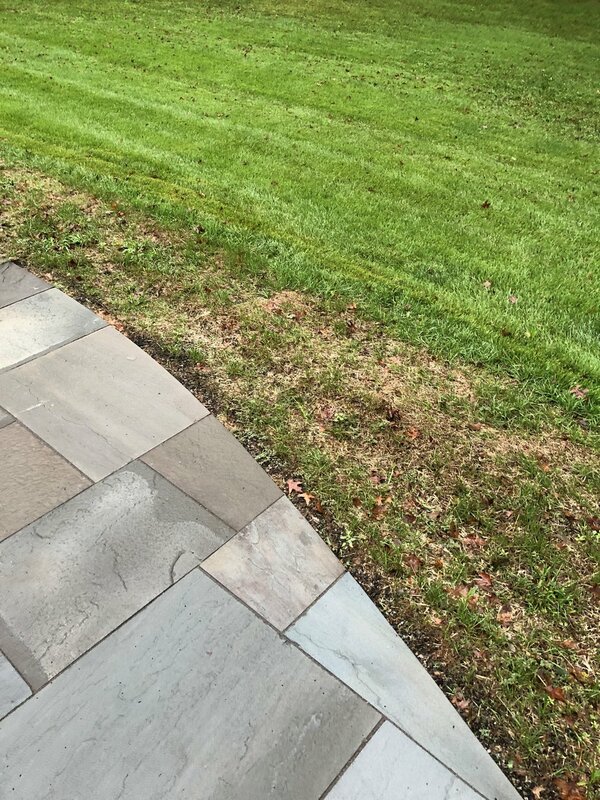 We added topsoil and planted grass seed so the walkway would blend seamlessly into the existing lawn. 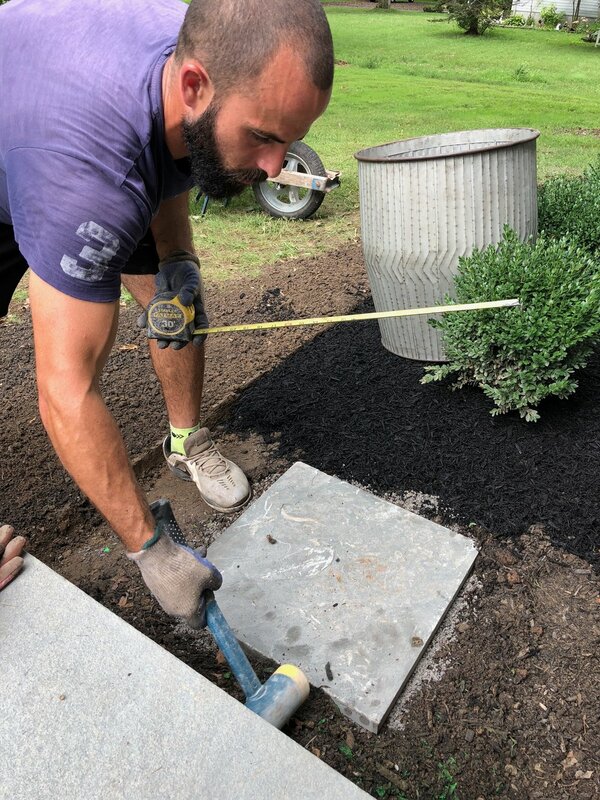 After the landing, walkway and grading were complete, we finished up with mulching the new beds. 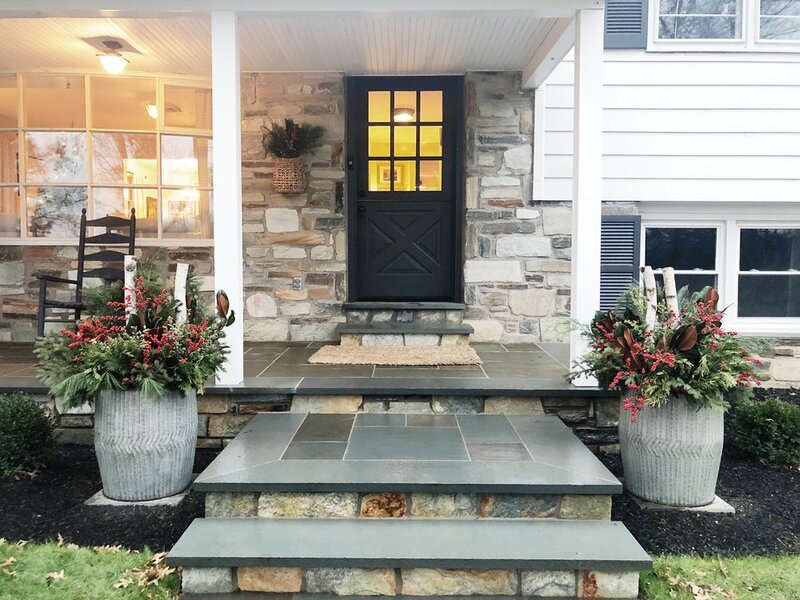 We decided to add a barrel planter to either side of the landing. 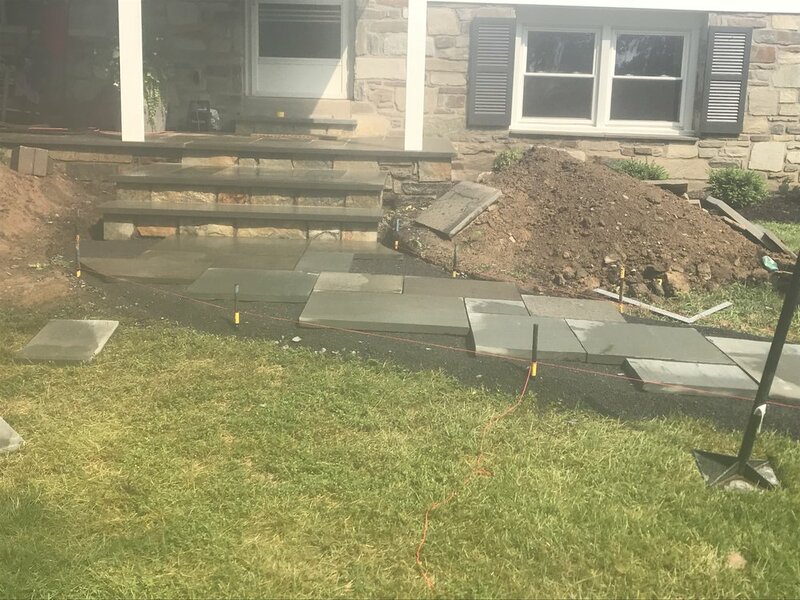 To make sure that they were level and standing upright, we placed them on top of extra flagstone from the project. Fast forward to October! We ordered a dutch door from Niece Lumber. We then painted the door to match the shutters and had it installed by our friend Tim at New Hope Remodeling. 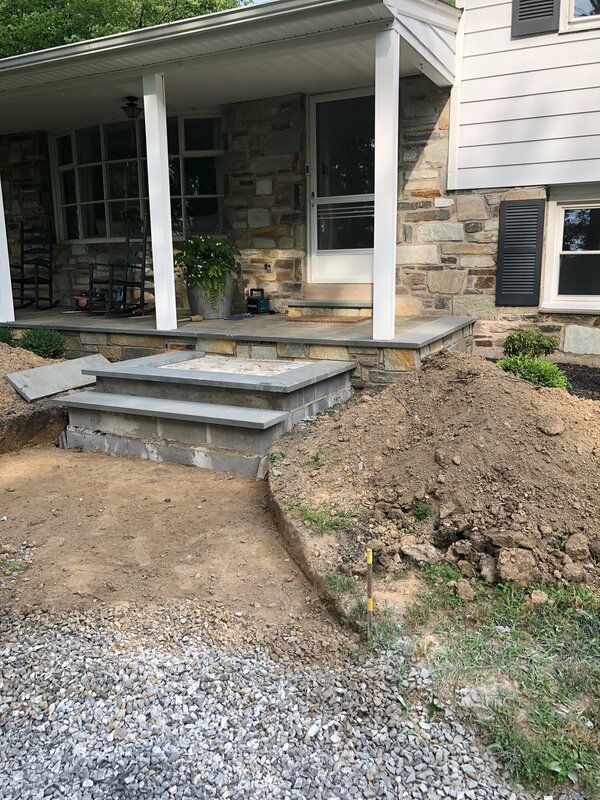 Mike also updated the front door steps with the same stone from the house and with matching flagstone from the porch. We also painted the rocking chairs that came with our house when we purchased it. 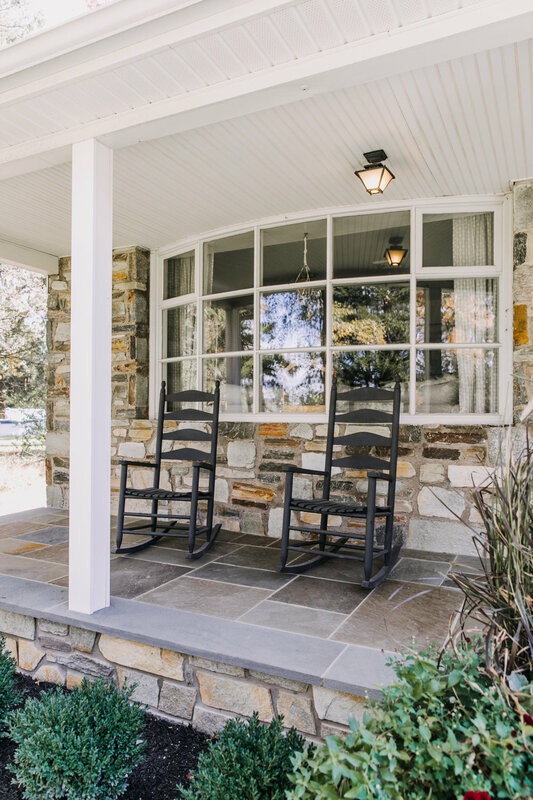 I love that we were able to use the existing chairs, but update them to match the front door and shutters. I had so much fun getting these planters ready for fall. Updating the plantings for each season will definitely be something I look forward to throughout the year. Here, I used planters from The Living Earth and then layered in cabbage plants for a fall touch. This was what I had been looking forward to! 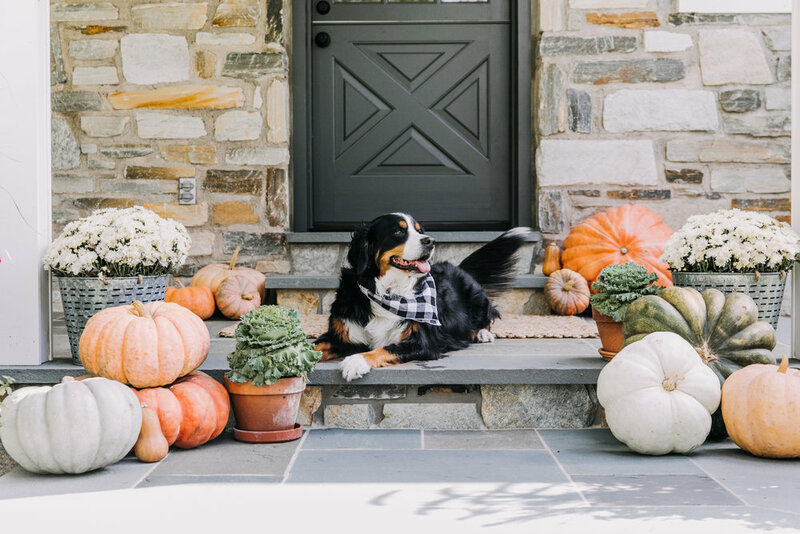 Decking out the landing with tons of pumpkins, mums and cabbages. So exciting when the first Christmas season rolled around with the new setup!